Stampin' Up ideas and supplies from Vicky at Crafting Clare's Paper Moments: Mmm... Bloomin' Marvellous nectar! I made my postage stamps by stamping some of the leaves from the set onto some Very Vanilla card stock and punching out the bits I wanted with my 1" square punch. Next, the flowers were added and by using the tiny flower from Summer Silhouettes, I got a completely different look. A quick sponge round with a dauber and some Marina Mist ink and the stamps were ready to mount onto postage stamp shapes punched out of Naturals Ivory card stock. The nectar from these flowers must be delicious because that gorgeous little humming bird from Bloomin' Marvellous looks very happy! You can see I've used my markers to add a little definition to the plants and the little bird. This is the 'thanks' from A Word For You - you may have seen me cut this sentiment out before. I love the movement in it! Here's the sketch I was using today. I'd be delighted to order any of these items for you and have them delivered straight to your address in the UK. I'm committed to providing excellent customer service and am always happy to offer help and advice. To place your order, just send me an email or give me a call on 01280 820593. Everyone's back to school again now and the snow has turned to a treacherous ice. I've been amusing the neighbours by walking about like a heron in my efforts not to amuse them by slipping over and landing on the old derriere! Is it spring yet?! I'll be back tomorrow with a fast idea for Three Minute Thursday. Hope to see you then! 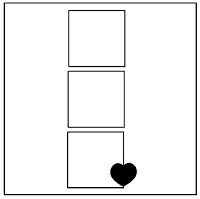 What a lovely card you've made using the sketch. Love how the humming bird and sentiment balance each other. I can see Bloomin' Marvellous getting used for all sorts of cards. This is a CAS beauty Vicky, I love that little postage stamp punch, and the little floral scenes you created. Love the inchies and the way you added the bird and sentiment is fantastic! Gorgeous card! So spring like too! Love the idea of the little stamp squares. I love the simplicity of your card it's brilliant. Such gorgeous colours and a fantastic sentiment. This is absolutely beautiful Vicky. The little squares are so cleverly done and love the addition of the humming bird. Thanks for joining in over at MMM. 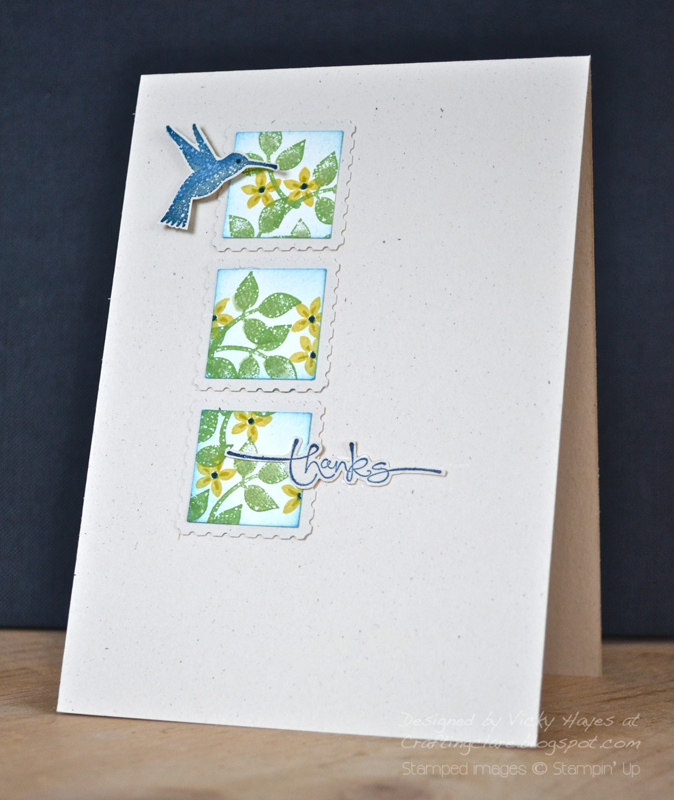 What a pretty card and great take on the sketch, that little punch really works so well with the stamps...and no its not spring yet !! !